A group of friends from the north-east are preparing to take on the Prime Four Beast Race Banchory to raise funds for the RNLI in Macduff. The Beauties and the Beast team is made up of 20 women and a man aged between 25 and 48-years-old. Having signed up for the race, the friends decided to raise money for the lifeboat crew where some of their husbands are volunteers. Elaine Sim, who works as a staff nurse at Chalmers Hospital, said they were hoping to raise as much money as possible. The 33-year-old said: “We’ve set the target at £500 but we’re hoping to smash that since there are 21 members in the team. “If we all raised £100 that would be £2,100 which would be incredible so fingers crossed. 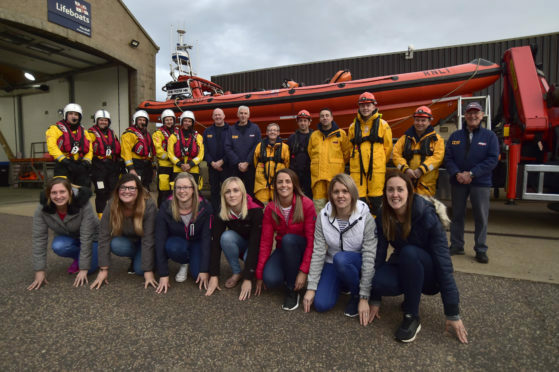 “The reason we chose the RNLI is because we wanted to raise money for a local charity and four of the team member’s husbands are part of the Macduff crew. “They do a great job at keeping our local waters safe 24 hours a day seven days a week. “They are always on call and respond immediately when the pager goes off regardless of what they are doing. Competitors will take on a 6.2 mile obstacle course which will involve them sliding, climbing and wading their way towards the finish line. Some of the group took on the challenge last year and, joined by more friends, decided to do it for charity this year. Mrs Sim, who will compete with Iona Milne, Cheryl Smith and Charlene Gallon as well as other friends, said: “It’s great fun, we had such a laugh and managed to complete all the obstacles. Mike Rawlins, from RNLI Macduff, said: “We are delighted that Elaine and her friends have chosen to raise money for us as they aim to tame the Beast in Banchory next weekend. “All the money raised will be used in Macduff to fund our ongoing crew training. “We have a number of new crew members who have to go on to residential courses in the near future to complete their basic crew training. The beast race takes place on September 22 with donations still accepted up to a month afterwards.